Chip holds a Bachelor’s degree in Agricultural Engineering with an emphasis in Structural Systems from the University of Georgia (1998). He is a licensed Professional Engineer in Georgia, South Carolina, North Carolina, Mississippi, and Virginia. Chip grew up in Jefferson, Georgia, where he currently lives. Luke began working for Skywark Engineering in 2006. Prior to working for Skywark Engineering, Luke worked as a project engineer designing waste water management facilities. Luke holds a Master’s degree in Civil Engineering with emphasis in Structural Engineering (2004) and a Bachelor’s degree in Civil Engineering with an emphasis in Structural Engineering (2003) from the Georgia Institute of Technology. He is a licensed Professional Engineer in Georgia, Florida, South Carolina, North Carolina, Kentucky, Louisiana, Alabama, Indiana, and Tennessee. Luke grew up in Atkinson, Georgia and currently lives in Woodstock with his wife and twin daughters. Gary began working for Skywark Engineering in 2006. Prior to working for Skywark Engineering, Gary designed and tested lightweight pressure vessels for hydrogen storage at the Georgia Institute of Technology. Gary holds a Master’s degree in Civil Engineering: Structural Mechanics and Materials from the Georgia Institute of Technology (2007) and a Bachelor’s degree in Agricultural Engineering with an emphasis in Structural Systems from the University of Georgia (2005). He is a licensed Professional Engineer in Georgia and Florida. Gary was born and raised in Sandy Springs. The youngest of five children, Gary spent much of his childhood helping his father, an engineering professor, build several family homes. Gary currently lives in Smyrna with his wife and two dogs, and in his free time enjoys working on his own home. Greg holds a Bachelor’s degree in Civil Engineering Technology from Southern Polytechnic State University (2006). He is a Georgia Soil & Water Conservation Commission (GSWCC) Level 1B Certified Inspector, an ICC Certified Residential Building Inspector, and a Member of Sandy Springs Private Professional Engineer Inspector Program. Greg grew up in Jonesboro, Georgia and currently lives in Acworth with his wife and two children. 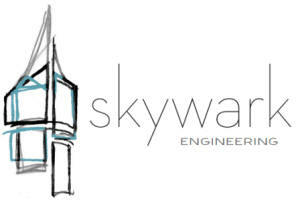 Linwood began working for Skywark Engineering in June 2011. Prior to working for Skywark Engineering, Linwood utilized CADD to design store layouts and drafted documents for churches, parking garages, and multi-scale commercial remodels. Sharon has been with Skywark Engineering since August 2011. Prior to Skywark Engineering, Sharon took time out of the workforce to stay at home with her children. She also volunteered with her local elementary school’s PTA and Mothers of Multiples Group. Sharon holds a Bachelor’s degree in Management with an emphasis in accounting from the University of North Carolina, Asheville. She is a Certified Public Accountant.